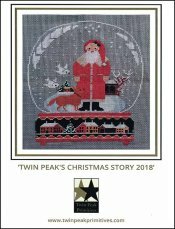 Twin Peak's Christmas Story 2018 [C5827] - $18.00 : Yarn Tree, Your wholesale source for cross stitch supplies. Cross stitch pattern by Twin Peak Primitives. This is the same cross stitch design as "Swallow And Santa Globe" (C8796), but this design comes with a story for you to enjoy! Ho, ho, ho Merry Christmas! Santa has arrived! Santa, with a dog by his side & two swallows flying overhead, stands in the middle of the snow globe. Snow is falling & decorating the ground, as Santa waits to greet all of the boys & girls. You better start making your list & checking it twice! Stitch count is 97W x 128H.